FOXBORO, Mass. 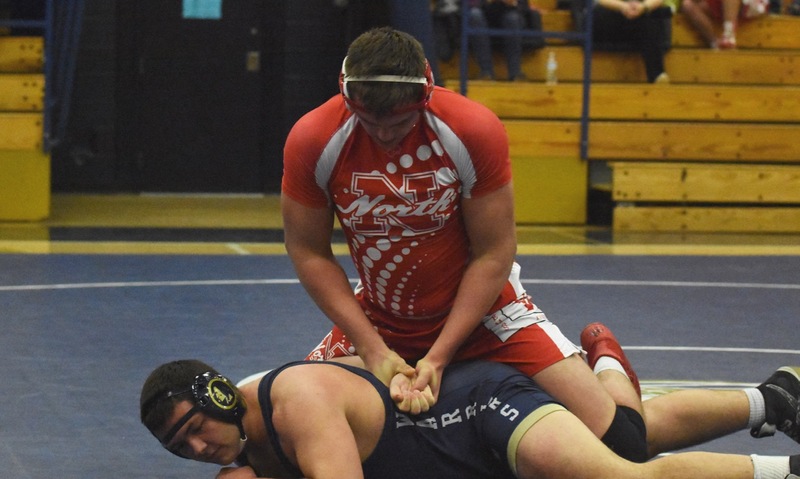 – North Attleboro started the dual meet season 4-4, as a young roster tried to acclimate to competing at the varsity level against some of the top teams in the state. The Rocketeers have progressed over the course of the season and entered Wednesday night’s meet at Foxboro having won 10-of-12 meets. The development of the North team was on full display against the Warriors, as the Rocketeers earned five pins as a team, won five straight matches through the middle weights to pull away, and took home a 44-21 victory that clinched a third straight Davenport title and fifth straight Hockomock dual meet championship overall. North got off to a 6-0 start, as Tanner Ferguson earned a 9-4 win at 106 pounds, scoring five unanswered points in the third period to take the victory, and Alex Yan won a 3-0 decision over T.J. Whitehouse at 113. The 120-pound match, although only the third match of the night, was the turning point. Foxboro was counting on big points from Adam Lanctot, who is one of the top wrestlers in the state at that weight class, but he struggled to put away Ethan Smith. Leading 7-6 in the third period, Lanctot aggressively went after more points and Smith caught him, went on the attack, and got a pin that drew the loudest reaction of the night from the North bench. “That was it,” Burgess said. “That match right there pretty much swung it. There were a bunch of coin flips but that wasn’t, they had the advantage. It’s one thing to catch a kid and put him on his back but to stick him, that was huge. That was a nine-point swing in our favor and it’s a different match if they win right there. Cam Hassett edged Griffin Gouck 5-4 at 126 pounds to get Foxboro its first points of the night and the Warriors got back-to-back pins from Shayne Kerrigan (132) and Tommy Gallagher (138) to grab its only lead of the night. North responded right away. Mike Burns got a second round pin at 145 to make it 18-15 and Mike Edmonds followed with a dominating match at 152, getting three back points in the final second to earn a tech fall and the bonus points. Montrel Jackson added a pin in the first minute at 160 to put the visitors ahead 29-15. The run continued at 170, as Max Warsofsky used a late surge to pull away for a 6-1 win and then Liam Risk pinned his opponent at 182 to make it 38-15 and seal the win and the title for North Attleboro. Aidan Dow won 5-1 for Foxboro at 195 and William Ogbebor won 3-1 in a battle with John Kummer at 220, but North finished on a high. Mateusz Kudra, the University of Virginia-commit, got a pin at 285 to wrap up the meet. North Attleboro (15-6, 5-0) will head to the Div. 2 duals this weekend and Foxboro (22-5, 4-1) will wrestle at the Div. 3 duals at Ashland.